So… Just how do you mend a broken hip? The Amazon ebook reviews are in – here are what people are writing! Remember, these patients are going to, voluntarily, have someone remove part of their femur, and yet 93% (you can’t even get 93% of people to agree whether chocolate or vanilla ice cream is better) still are giving this hip replacement book 4 and 5-star reviews. Husband (who hates to read) says: BEST BOOK EVER, just what he needed. My hubby is having a Posterior Total Hip Replacement next week. I read the reviews of this book and purchased it for him, sending it to his Kindle. He is not a reader – but he read it, read it again, and yet again! He has gained so much information from this book and it has helped him immensely. Thank you so much!! We had his pre-surgical appointment with his Surgeons office today – and guess what he recommended?!! This book. I gave them the book information off of Amazon.com and they will be reading the book and possibly looking into it for recommendation to their future patients. My husband just loves this book and I anticipate that he will be utilizing it in the next few months as he recovers from his surgery. Mr. Aries — thank you so much!!! 5.0 out of 5 stars – Must read for hip replacement patients. From a healthcare professional: As I approached my upcoming hip replacement, I found myself in the interesting position of working in the medical field and having great knowledge of rehabilitation but wanted to gain a deeper understanding from the patient’s perspective. This book not only lived up to that expectation but exceeded it. Now 2 days post op, I plan on returning again and again to the book for reference and encouragement. 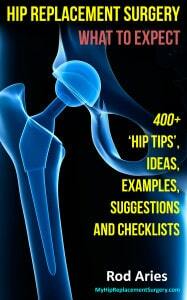 From a healthcare professional: This book is a MUST have for anyone who is getting ready for a hip replacement. I am an RN and have had 3 hip replacements. I will use this book with my patients!! If you need a good laugh while pondering hip replacement, this is the book to read. The author gives you an honest approach and tells you of his first-hand experience. 5.0 out of 5 stars – Thank you! I liked this book because it is an honest, straightforward account of this man’s experience. I have learned a lot and now feel a lot better going in for my hip replacement in a few weeks. Thank you, Rod! Now available in Kindle format at Amazon. Don’t have a Kindle? No Worry. You can download the free Kindle apps and software to your Android, iPhone, iPad, PC or Apple computer and read it from your screen. It Gets Worse – In the last year leading up to my hip replacement surgery, every month was noticeably worse than the previous month – but enough about my mother-in-law living with us, let’s talk about how my hip pain adventure may shed light on your hip pain. 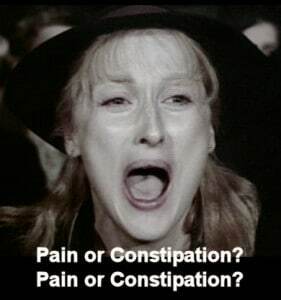 “Is My Hip Really Bad?” – I list the most common symptoms indicating a hip that needs replaced. While there a variations for everyone, there are also common indicators. What To Buy And, As Importantly, What Not To Buy – I bought quite a few things to combat my hip pain, OTC medications, tools and gadgets, assistive aids, even medical marijuana. I will share my experiences with you. Don’t Let My Biggest Mistake Be Yours – My biggest mistake? Not getting my hip replaced much, much earlier. Read on and see why. You can join our Facebook hip replacement surgery page. You can follow us on our Twitter hip replacement surgery page. You can follow us on our Pinterest hip replacement surgery page. Just What Is A Total Hip Replacement? Total hip replacement (THR) is a procedure whereby an orthopedic surgeon replaces your painful, dysfunctional hip joint with a highly functional, long-lasting artificial joint. Your hip is a ball-and-socket joint. The round head of your thighbone (femur) moves inside this hollow socket (acetabulum) of your pelvis. This anatomical fit is what allows your leg to move easily from your hip. 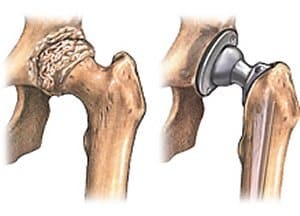 To replicate this action in a failing hip, a THR implant consists of three parts: the stem, which fits into your femur and provides stability, the ball, which replaces the spherical head of your femur and the cup, which replaces your worn-out hip socket. Each part comes in various sizes in order to accommodate various body sizes and types. In short, a total hip replacement is just what it says – your doctor replaces the bones in your hip with artificial bones. Bad hip (left) becomes good hip. You Are Not Alone – The CDC reports there are over 330,000 hip replacements per year in the United States. At a recent conference of the American Academy of Orthopaedic Surgeons it was reported that there are 400,000 annual replacements. Better Odds Than Winning The Lottery – If you have an artificial joint, like two of every 100 Americans (seven million people), you are part of a special group of those with surgically repaired knees and hips. If you are over 50, you are part of group with five percent having a replaced knee and two percent with a new hip. For perspective, your odds of winning the Mega Millions lottery is one in 259,000,000. Your Experience May Vary – My hip replacement surgery went pretty much like it should. I was in pain, I had surgery and I got better. However, much like miles per gallon ratings for a car, having to watch someone else’s kid in a school play or trying your mother-in-law’s new recipe for a food you really don’t like you may have an entirely different experience with your hip replacement surgery than I had. Here is a condensed version of my hip replacement encounter. It is probable that you will have a similar experience. “I See Dead People,” Diagnosis By A Car Salesman – My wife and I went to a car dealership to drop off her car for repair. I walked through the showroom while she was checking in. A salesman approached me and I was ready for the, “Can I help you,” line. Instead the salesman, sounding like the kid from the movie, The Fifth Element, commented that, “I see you have the same thing I have.” He paused and when I looked slightly confused (sadly, normal for me) he continued, “I see you need to have your hip replaced. My operation is next week.” I was stunned and knew that over the past year I limped slightly at times, but I wasn’t aware of how obvious my ‘groin pull’ was to outsiders. And I didn’t think I was a candidate for a hip replacement. His diagnosis was two years before my operation (I wonder how many others can see dead hips). I Am A Psychic Too – As a side note, I am psychic too. And because you bought this book I am going to give you a free, instant reading. Wait, wait… I am vibing you in right now. It’s coming, it’s coming… (Yeah, you! You with the book in your hand, rolling your eyes.) Here it is, my psychic reading tailored just for you, and ONLY you – if you have read this far, your hip is bad. You’re welcome. None Shall Sleep – Nobody wants to come out of anesthesia on the operating table and hear Pavarotti singing “Nessun dorma! Nessun dorma!” definitely not me. More on what happened during the operation in ‘More Anesthesia (Part Two),’ a little later. Sounds Worse – I wasn’t real excited about having my upper thigh and buttocks area sliced open, then having my hip forcibly dislocated (to a loud pop, I might add). Next, in a procedure worthy of Vlad the Impaler, the head of my femur was sawed off, followed by having a hole drilled down my femur and then a replacement femur spike driven in. This was followed by having my hip reshaped and resurfaced to receive a receptacle cup screwed (yes, imagine Home Depot – aisle eight, on the right) into my hip bone to receive the new femur head. Finally, this operation is followed up by lots of sutures and many weeks of recovery. 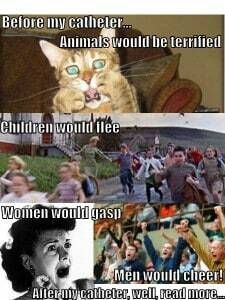 Having said that, it sounds worse than it really is… seriously. Pain, Pain, Go Away (Transfer It To Your Friends) – That above sequence is much easier to recite AFTER you have had the surgery. And, as a bonus, you get to see people’s faces look incredulous after you tell them what is involved. It is as if they have experienced some of your pain. While I can’t see your face to know if you understood the graphic details of the process, I might guess your eyes got a little wider if you didn’t. After your surgery, when your storytelling turn comes, watch the facial expressions of your friends and family – it makes all your pain go away. Well, It Does Get Better – Overall, the post-operative pain was just a fraction of the preoperative pain. I was now free of hip pain and well on my way to recovery, so the surgery is well worth the brief pain of recovery. You can read the Forward Hip Replacement Surgery to the book below and click here to read a sample ‘Hip Tip’ on the one aspect of surgery that will impact you, but nobody talks about – constipation, if that doesn’t get you excited about surgery, I don’t know what will. You will have a choice, just choose wisely.